I just love this picture, there is so much truth and victory in this picture. 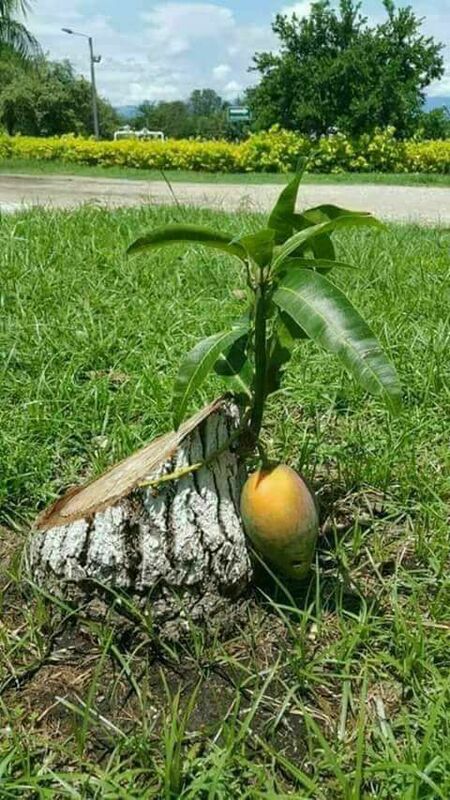 This is a mango tree that someone cut down to just a stump and left for dead. But the roots on this tree were strong. Not only did the tree live, it grew a new branch AND one fruit. Now this tree could have looked at itself and been discouraged, it could have said, “I used to produce hundreds of fruits but now I only have one.” Or this tree could have said to itself, “what was meant to kill me has only made me stronger, and look I still bore fruit!” The same applies to us, the enemy comes to steal kill and destroy but Jesus is in the business of bringing dead things back to life. Maybe you feel like the enemy has under cut you and left you for dead. Maybe the fruit in your life right now seems small compared to what you expected or to what you used to produce. But remember, Jesus brings dead things back to life, He restores what the enemy tried to kill. But the moral of this story, is really about the root system. If our roots go deep in Jesus we can never be left for dead. If you are in a good season invest in growing your roots deep into Jesus. If you are in a rough season call on Jesus to breath new life into the roots you have no matter how small. Even a small root, when given to Jesus is enough. No matter where you are, or what you are going through the Lord has perfectly positioned you to thrive. The Lord can bring fruit even from a stump left for dead.